This Primary determines who will go on to face the other partys candidate in November. This primary run-off is open to all registered voters, those that had voted in the March 1 Primary must vote for the political party they voted for originally. Highlands voters go to Highlands Elementary School to vote. Voters all have until Friday May 20 for early voting at any location inside the county like the Harris County Library Crosby Branch. Democrats vote at the Crosby Library on May 24 but Republican Precincts 0097, 0382, 0604 and 1008 vote at Newport Elementary School. While all others vote May 24 at the Crosby Library. House of Representatives District 128 that includes Highlands, Crosby, Deer Park and most of Huffman and part of Baytown sees a heated race between incumbant, conservative Wayne Smith against outsider, conservative, Briscoe Cain. On the Democratic ticket, a number of statewide offices, and locally the Harris County Sheriffs election, Ed Gonzalez runs against Jerome Moore. Ron Hickman, incumbent Sheriff, won outright the Republican contest and faces the Democratic Primary Run-Off winner in November. Above all races the most contested is for Harris County Precinct 3 Constable. North Shore resident Michel Pappillion is facing Barrett Station native, Sherman Eagleton. Originally this contest had eight candidates. This post is held by Ken Jones but he is retiring. The winner will face Republican Don Webb who ran uncontested in March and awaits November. Three District Judge positions are on the ballot, For District Judge in the 11th Judicial District Kristen Hawkins is opposed by Rabeea Collier on the Democratic ticket. For the 61st Julie Countiss faces Fredericka Phillips. Elaine Palmer and JoAnn Storey face off for the 215th Judicial District. On the Republican side, Railroad commissioner vies Gary Gates vs Wayne Christian. There are two races for Judge positions in Criminal Appeals. Ray Wheless faces Mary Lou Keel for the Court of Criminal Appeals, Place 2. Scott Walker is opposed by Brent Webster for Court of Criminal Appeals, Place 5. Early Voting will started on Monday, May 16 and run through May 20. Hours are from 7 am to 7pm. There are 44 locations in Harris County for Early Voting, and you can vote at any of them. CROSBY  John Foley, President and C.E.O. 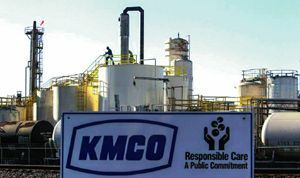 of KMCO Inc. , a Limited Partnership, sat down with the Star-Courier to address concerns from residents following the release of a study done by the Mary Kay OConnor Process Safety Centers at Texas A&M about potential harm by hazardous materials at local businesses. KMCO has been here for 41 years. Over the last few years incidents have been taken to heart including the fires in August 2008, and Christmas Eve 2010, and the lawsuits over releases in 2008 for spills and fumes. Since 2013, the plant has won industry awards for safety and environmental concerns. We are going as fast as we can to discover any risk and figure out how to minimize it. In this business you have to expect people to ask questions. And you have to be able to answer them, so we want to be able to be proactive, said Foley. Kim George attended the meeting and answered the question of what reforms have been enacted at the plant. New scrubber systems have been put in place to take out the odors that might be emitted from the plant even if they are permitted. The plant has upgraded their digital control systems. They can now monitor release activities from the computer system instead of having to read the monitors out in the locations. Bringing technology into the plant has helped us monitor systems within the plant, the initial investment was over a million dollars. Master control captures any change, any outcomes from any audit systems that we need to pay attention to. Other things include a new storage tank that is safer and away from the rest of the plant so we can see more tank cars, thus reducing the number of deliveries and the number of connections necessary. One operation we have been working on is drumming material to ship it off site. We installed an automated drumming system, ahead of regulations. We are looking for ideas on what we can do to reduce risk, make it easier and our workers more productive. said Foley.